I am pretty lucky today – I get to share a Fall project with you for Fall Fever! We have had so many great tutorials and a couple great giveaways and I cannot wait to share the rest with you! And it also happens to be my turn to take you for a ride on the Creative Carousel! 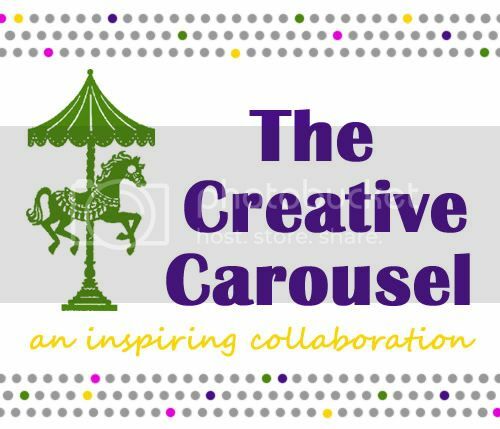 Have you guys had a good ride on the creative carousel so far? I hope you have visited all the cute girls that are participating to see all their “Fall” tutorials! I also hope you have taken the chance to enter to win one of the prize packages – It is totally awesome – I wish I could win! Alrighty – onto the tutorial! When I think of Fall – my mind automatically thinks of pumpkins – I have no idea why – I just love them! Second: Paint your Frame and your wooden Knob. My frame was brown to start with and I sprayed it Green (Rustoleum Eden) and then Sprayed it White (Rustoleum Heirloom White) so when I distressed it by sanding the different layers would show through. I also sprayed my knob Eden and then Rustoleum Expresso – and sanded it down a bit too. Third: While all the paint was drying – I traced my pumpkin template onto my orange scrapbook paper and cut it out. Fourth: I hot glued my buttons on. I started at the bottom with a bigger button and glued it so it hung down a bit lower than the rest since pumpkins have the little bump on them. Then I just went to town gluing on buttons – there was no rhyme or reason – I just grabbed a button that fit in the space and glued it on. This part actually went a lot quicker than I thought it would. Fifth: I wrapped the wire around a pen and made it curly (like the vines on a pumpkin!). I made 5 of them and did them all different lengths – since the wire was so thin, I just used my scissors (gasp!) to cut it. Sixth: I glued it all together. I glued my pumpkin onto the brown scrapbook paper I picked (after I cut it to the size of my frame (8x10)) and then glued the wires down and glued the knob over the tops of the wire. Lastly: I put it in the frame! I love the look of all the different buttons all together! The variety is so fun! What Fall and Pumpkin Projects are you guys working on? And remember that if you want a simple Fall project to add a bunch of color – you can click here my free Playful Fall Subway Art printable! This is soooo cute! I love buttons! I like all the different sizes, colors and shapes you used. I'm ready for Fall decorating but I want the warmer weather to stay around a bit. I love the colors in your subway art too. So, so cute Amanda! I love that you used a knob for the stem. Such a fun idea! This is so adorable! A great project for the kids as well. I'm always looking for unique crafts to do with my stepdaughters (11 & 7)...I think they both will enjoy this one and of course so will I! This is absolutely adorable!! Love it!! Please come link it up!! Very cute, I love button art. I love this idea. I especially like the wire vines. So cute! Thanks for sharing. CUTE! Thanks for the tut. I will have to give this a try. This is REALLY cute!! I featured it on my blog tonight. I love your button pumpkin! I especially like the green wire, too cute! Thanks for stopping by my blog and great minds do think alike :) Have a great weekend! So super cute! Love that you used so many different button sizes! I love this! I am totally going to make one!!! :) Thanks for sharing over at TTandJ! Very adorable! I'm going shopping today, and I'm going to be on the lookout for buttons! It's absolutely adorable, Amanda! I love it!! OK, this is gonna be so corny! YOUR fall exchange party last year was my first ever. It was so much fun and just thinking about that makes me wanna reach into the blogsphere and squeeze you! Just found this beautiful project at Someday Crafts and I am sooo inspired to make a few Fall crafts now! Love it, thanks so much for sharing! So so so cute! I featured this tonight at somedaycrafts.blogspot.com. I absolutely love this and will now be searching for buttons so I can make one. Thanks for the inspiration! This turned out really cute! I can't believe you found that many orange buttons. ;) Love the curly Q's to finish it off! Super CUTE! I put this on my blog and link it back to you, maybe you will get more readers! Are you okay if I do that?